Are you ready to let go of being a Victim of your relationships, your childhood, your family, your beliefs, your environment, your circumstances or society? Gina Pilon, through her own journey from Victim to Self-Actualized teacher and coach, found that by taking Responsibility we can claim our freedom and live a life of peace, contentment and joy regardless of our age, gender, past or current circumstances. Learn what her clients are learning and the personal freedom they are now able to claim for themselves. Take Responsibility by discovering what is holding you back from letting go of the Victim chain and living a life of freedom and unconditional love. Prices are in Canadian dollars and shipping is included in price. I have had the pleasure of walking alongside Gina as a fellow coach for a number of years now. Gina is a truly inspirational woman and has many wonderful examples of how she has helped individuals and couples with issues from their personal transformation… to their health… to their relationships… to grief recovery. Gina has a gentle and humble approach. She’s done the deep work, is on the journey that the reader embarks on. Gina has often learned the lessons the hard way, and transformed herself into a woman who truly takes responsibility for herself and her life. We are blessed to have Gina walking alongside us all in this life. Gina’s book, Responsibility is ideally suited to people who currently feel somewhat lost, are new to the field of personal transformation, feel a yearning to get their life on track, and recognize that the change must come from the inside-out. Gina shares 14 vital lessons that will help a person understand where to start and also takes the reader through a step by step process to re-discovering the person they are capable of being, underneath all of the poor coping mechanisms, and unhealed hurts along the way. Gina shares in a humble, transparent manner. She speaks from the heart with love and acceptance for both herself and the reader… and leads us to understanding through her own story, the vital importance of making the choice to shift from victim… to feeling vital, in control and happy. Even though I’ve shared in a lot of Gina’s path, reading her story gave me goose bumps and a sense of renewed inspiration for my own journey. Gina teaches about taking responsibility from a mind/heart/body and spirit perspective, taking a holistically responsible approach. At the core of these teachings is the ability to love and approve of the ‘self’. Gina shares how this is the foundational building block for learning to be truly responsible for oneself. Gina cleverly closes each chapter with closing summary thoughts to support the reader, as well as some thought provoking questions and space for journaling to support deeper learning. I strongly recommend completing this part as it deepens the learning and accelerates growth significantly. Gina, thank you for sharing yourself so openly with people who really need your guidance, lessons and help. If you are in a position to receive coaching personally from Gina, I wouldn’t hesitate to encourage you to work with Gina to help you transform your own life. I just finished reading Responsibility today after purchasing it yesterday and I must say it is definitely a must read. I could not put it down. I had to keep on reading. I found the book to be a truly honest look into our lives. No beating around the bush but touching on all aspects of life. Even if we have been raised in amazing homes with loving parents and lots of spirituality it makes us really appreciate what a gift we have but for those who were not so blessed. It makes us look deeper as to why people are the way they are or why they react the way they do. It makes us want to reach out and help others and have empathy for them. The chapter that touched me the most was Its Not Personal. Sometimes people say or do things that really hurt us and we wonder why or where its coming from so I realize now that I shouldn’t take the opinions of others so personally. I like the reasoning that we all come from different backgrounds, with different stories, different cultures, different beliefs, and different values. When we judge, we are coming to a conclusion based on these filters. This is helpful advice in life. I have also learned that living a clean healthy life makes for a happy life. I have been coached by Gina and have really benefited from her knowledge. I have known both Gina and her husband Andre for many years and have to say the book is honest and candid about their personal life and it has been a joy to see them through their struggles to where they are today in a happy successful marriage both working side by side. They are both very kind people doing anything to help anyone. Take the time to read this inspiring book! I have had many coaches in my life but none more inspiring than Gina Pilon. This remarkably gifted woman helped me to break the “victim chain” once and for all, setting me free onto the path of healing and recovery. 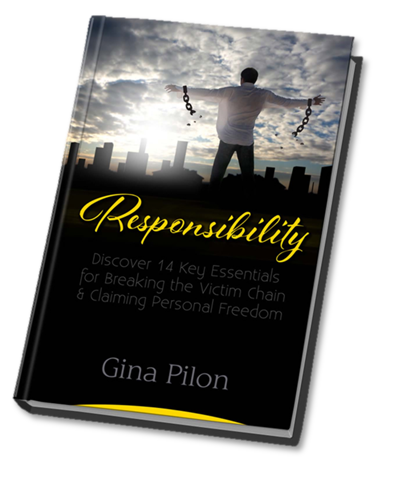 Gina’s wisdom was hard won — her book, “Responsibility”, a precious victory over the destructive forces of shame, fear and guilt which keep us from embracing our true and authentic selves. Reading this book is more than time well invested in self-help: it is a life “game changer”, a rally cry and successful strategy for those who seek the promise of inner peace, joy and personal happiness. A very timely insight to change and take control of your life! We are often afraid to face the past that haunts us and makes us incapable of change. The book is honestly written from a place of authenticity. Gina’s writing style is easy to follow and her message will resonate with each and every one of us. You are responsible for your own life! Let your New Year resolution be to read Responsibility. Must read for everyone! I have read this book 5 times and each time taken something more from it and looked at things so differently so much more clearly in my steps of healing. It’s going to be a long journey but one with each baby step I take I am feeling more secure and complete with myself and reminding myself each day that I will no longer allow people to hurt me, that I am taking charge of myself so thank you Gina for giving me this courage and strength to make these changes with your 14 steps. I really look forward to your next book(s) as you truly have a gift for helping others. I am not much a reader so I was amazed when I completed this book in one evening! A captivating book written from Gina’s heart about her “walking wounded” journey of strength, to reclaim her personal freedom. Self-reflective and inspirational. By purchasing, you are giving me permission to add you to my email list and send you my Responsibly Healthy tips. I value your privacy like I value my own; I will not sell or rent your email address. You will be able to unsubscribe at any time.